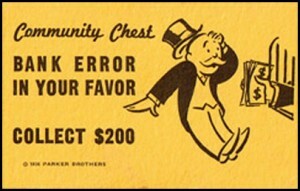 BANK ERROR IN YOUR FAVOUR? HOW WOULD you react if a substantial sum of money was mysteriously lodged to your bank account one day? Would your first phone call be to your bank manager or your travel agent? Would you attempt to find out where the money came from? Or would you cross your fingers, do nothing and pray that no one ever noticed? Suppose you’re a struggling writer, grinding out a precarious living at an independent magazine. Your rent is exorbitant and your budgeting skills Neanderthal. The money would make the next few months considerably easier. Are you absolutely confident you would do the right thing? It’s not an abstract question. Late last year, out of the blue, €1,800 was lodged to my Ulster Bank account without explanation. I had a couple of theories. (1) This was an outstanding payment someone owed me that I had forgotten about. This wasn’t completely inconceivable. But, given the amount in question, it was highly unlikely. (2) Some (extremely generous) friend or relative, wanting to assist me financially, but assuming I was too proud to accept charity, had lodged the money to my account anonymously. That theory, unfortunately, was even less plausible than the first. Everyone who knows me knows that I would never be too proud to accept charity. The most likely explanation, I correctly surmised, was that the bank had made a mistake. I’d like to say that I agonised about what to do. But that would be an utter lie. When a friend, over breakfast, suggested contacting my branch, I laughed so violently that a Rice Krispie and a trickle of milk exited my left nostril rather abruptly. I haven’t played Monopoly in a few years, I said. But the last time I did, the Community Chest said “Bank Error in Your Favour – Collect £50.” Not “Bank Error in Your Favour – Contact Your Branch Manager and Notify Him of His Mistake”. Besides, by the time I realised the money was even there, I had already spent a large chunk of it. I have a strict policy of never checking my bank balance and never opening any letter that has my name printed on the front. I’m young, free, single and willing to live on baked beans for a week or two when the need arises. The whirr of the bank machine is my accountant. If I hear it, I’m solvent. If I don’t, I’m not. Was keeping the money morally justifiable? Ulster Bank’s operating profits for 2007 were €353 million. Mine were considerably less. So on a Robin Hood level I had certainly done nothing wrong. But on an moral level it wasn’t quite so clear cut. Still, I thought I had a case. The American philosopher Judith Jarvis Thomson advocates “thought experiments” as a tool to solve complex moral conundrums. Here’s the one I composed to absolve myself of guilt. A farmer puts enough diesel in his tractor to plough a field. While he is having lunch, a stranger sneaks on to the farm and siphons extra diesel into the tractor. The farmer then ploughs the field. When he’s finished, he notices that there is still some diesel left in the tank. So he drives his wife into town and treats her to dinner, and afterwards they go dancing. On the way home they stop for kebabs. The next day the stranger presents the farmer with a bill for the diesel. If the farmer refused, on the grounds that he had spent all his money on dinner and dancing and kebabs, would he not be justified? I think he would. Case closed then. My only real regret, then, was getting caught. The phone call finally came one morning last month. It was the Ulster Bank. They wanted their money back. But the money was long gone by then. So I dropped by the branch for a bit of a chinwag. As I sat outside the manager’s office I was defiant, unrepentant and in thrall to the elaborate defence I had concocted. But, deep down, I was dead wrong, and I knew it. The meeting was anticlimactic. The bank manager was young and eminently reasonable. I didn’t need to play the poor mouth with him. He knew I was poor. So he said that I could repay the money, interest free, in instalments. “It was our error,” he said. I was grateful and readily agreed. We hammered out some terms. “Did you bring along your passport and a utility bill?” he asked. I nodded and flattened the crumpled documents out on the table. He picked up the utility bill as if it were evidence in a murder trial. The letter was dated January 19th and had a couple of footprints on the back of it. “It’s unopened,” he observed. I smiled a deep, embarrassed smile. This didn’t look to be a deal-breaker. But if I was wearing a necktie, I’d have been nervously re-adjusting it just about then.